"...the play is different every time." Some time ago I read this author's Lost City Radio, and loved it. Absolutely. Now he's back with At Night We Walk in Circles, and I loved this one even more. The blurb describing what's on the inside doesn't even come close to describing what actually happens in this character-based novel, which I would say focuses largely on identity, how past events come to be re-imagined, and the effects of blurring the thin line between reality and artificiality. Set in a South American country somewhere (likely Peru based on a number of clues in the story), the novel opens with the story of Diciembre, a theatrical group formed by a group of "radical students" at the city's Conservatory during the war. Their slogan was "Theater for the People," and they often went out into the "conflict zone," where'd they perform plays. It was risky, but then again, being in the city also had its hazards: Henry Nuñez, the lead actor and author of the play The Idiot President, was arrested and sent to prison. His crime was one of "incitement," and he remained there from April through November, 1986, incarcerated as a terrorist. From his prison cell, he made a radio broadcast, a "jailhouse interview" heard by many people, but by one person in particular who at 8 years old, was so impressed that Henry became his hero. This is Nelson, who became intrigued about the occupation of "playwright," and who already had been making up his own dialogues about a girl with whom he was secretly in love, sometimes acting them out for his brother. His brother explains that a playwright is someone who makes up conversations and calls them scripts, much like what Nelson had already been doing. It was then that Nelson decided that he wanted to do that as well -- it became his dream to become a playwright. As the wartime curfews continued, Diciembre staged all-night shows such featuring such entertainments as "pop reworkings of Garcia Lorca," "stentorian readings of Brazilian soap opera scripts," and "anything that kept audiences awake and laughing through what might have otherwise been the long, lonely hours of curfew." As the 80s closed, and into the 90s, the troupe was a shadow of what it used to be. Things were changing in the country as well -- the capital had been "reimagined" in such a way that made it seem that no "unpleasant history" had ever happened there. In 2000, the anniversary of Diciembre's founding prompted some of its "veterans" to mark the event somehow, and they decided it might be fitting to take The Idiot President on tour out in the countryside. Henry was brought in from his now-quieter life to participate, "but only if a new actor could be found to join." His friend Patalarga is on board, and enter Nelson, now a theater student at the Conservatory, who ultimately gets the third part. The timing is perfect and Nelson needs an escape, especially since the woman he loves has set up house with someone else, and since the death of his father, he can't leave mother for his long-awaited trip to the US. As the men wait at the bus station before they are taken away, Henry tells Nelson that they're "entering the world of the play now...its constructed universe," and that he should "give in to it." As the narrator tells us, the beginning of the tour is "when the trouble began." "his confidantes, his lovers, his classmates, people who'd seen fit to trust me, as if by sharing their various recollections, we could together accomplish something on his behalf. Re-create him. Reanimate him. Bring him back into the world." Using these interviews and words from Nelson's journals, he tries to piece together the chain of events that started with Nelson going on a tour for a play with two other actors, because he feels some kind of bond with Nelson. The thing is though, that each person he interviews knows Nelson from a different vantage point, from different situations in which Nelson has played different parts, so that eventually we find that there are a number of different Nelsons. How then is it possible to know the true Nelson? Is it possible at all? Even he is aware of himself as an actor -- at the last drink he had with his brother he came to the realization that everyone, including himself, is always acting. When all is said and done, and as you come to the end of the story, you start to wonder if even Nelson really knows who he is any longer. What I find striking about this book is that it is built around actors, their roles, performances, scripts and improvisations -- all tools used to create illusion. Re the title: As Henry asks earlier, when he talks to the narrator about walking in circles while in prison, "how do you set a play in a world that denies your characters any agency?" I'm not exactly sure, but I think this statement may provide some clue. 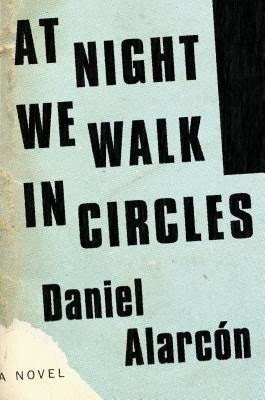 At Night We Walk in Circles is definitely not easygoing as far as the reading. This book could be the easily be included in a literary or history course, one that spends most of the semester analyzing it. All the same, I love this writer's work and this one I can only describe as hypnotic and haunting, mixed with a touch of very dark humor at times. Highly recommended -- take it very slow, though. It's not a book you want to rush through.